here it is all cut! and it smells wonderful already. My sister has already put her name on the list to get one of these once it is cured. Blue Raspberry Icee: Some like it sweet and some like it tart. Everyone will love the two combined. ps still cutting and putting the labels on the Jasmine soap, hope to have that finished this weekend then I will have more soap time! Nothing to exciting to report this week. I have been finishing up a large pillar candle order. I have 2 more candles to pour in Cranberry Woods scent then it will be done. All that is left and what I started working on last night is getting labels on them, pictures and then put into the cello bags. I would post a picture but I would rather wait till the client gets them first so they see them before anyone else does. Should be able to post pictures in a few more weeks when they ship out. 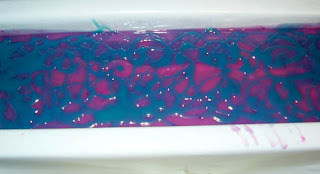 As far as soap goes I think I will be making a fresh batch of Forbidden Fruit tonight. A good deal of soaping time is spent remaking batches of soap you have already been making, which means that I don’t always have fun stuff to report. Soon I will also be using all my free soap making time to label those 120 half bars of soap for the Baby Shower. So that may slow soap production some in the next few weeks. Some new things coming up I think will be a fresh batch of Black Raspberry Vanilla, I also need to get some more oatmeal milk & honey FO in as I ran out of that soap and scent. Always the fun part of soap and things you have to consider is does someone really want to smell like this scent? Candles are easy as it is just a matter of burning it not wearing it so that opens up way more scents. Aside from the Banana I have a few summer type scents in mind I just need to get them ordered so I can try them out. Anyone have some favorite summer scents you like? I am thinking light and fruit type ones will be good. 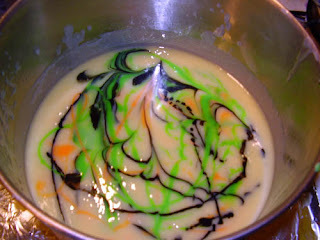 this one did get sorta chunk like when I poured the FO in but was still able to work with it unlike some other scents. but I think I messed it up. I have learned that a little black goes a long long way! looked great in the pot but then when I poured it into the mold it pretty much turned all black. I mixed some colors on top so maybe I can still make it look ok. going to be interesting to see what the color is under the top colors. I finally finished all the Jasmine!! 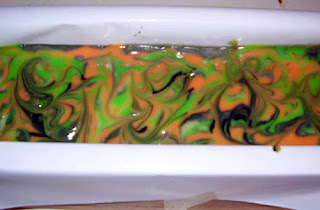 So I plan to make Mango Mandarin Soap tonight. Only I have a problem, I forgot to order the orange gel tone! So I am trying to decide what colors to make it. I have a touch of yellow(not enough to change red to orange), some melon color. 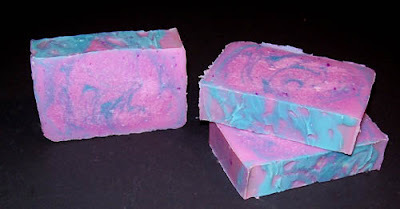 I have been wanting to make a black bar with some color swirl in it, just not sure how black soap will go over with everyone. It was tough getting people on board with the brown soaps in the beginning so the black makes me nervous. 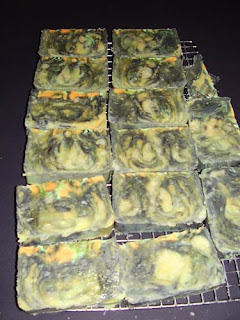 It is amazing how people do judge the soap based on the color, the brown soaps got alot of those look gross?!?!?! yet they in theory look more natural, who knows right? Or maybe I will just toss every color I have in and make a 6+ swirl batch? Going to be interesting to see what I do when I am standing there ready to mix colors.